Sometimes I would listen to friends or loved ones complaining about their colleagues or bosses. Well, so far I'm a bit lucky for I've never seen / involved in any office politics or encountered any colleagues who pissed me off. Through my working life, I should say that I'm lucky enough to meet a lot of nice people. It is also my principle to be nice to the people around me. In my last trip back to Kuantan, together with some friends, we had coffee with my best friend's uncle who shared with us the principles behind The Golden Rule and The Platinum Rule. The Golden Rule states that "Do unto others as you would have them do unto you." This statement basically translated that says to treat others the way you would like to be treated. On the other hand, The Platinum Rule says that "Treat others the way they want to be treated", which is even tougher to achieve. Now the focus of relationships shifts from "this is what I want, so I'll give everyone the same thing" (under the Golden Rule) to "let me first understand what they want and then I'll give it to them" (under the Platinum Rule). And speaking about treating others the way they want to be treated, it reminds me of a situation a year ago. It was a rainy day and the traffic lights at a T-junction in SS3, Petaling Jaya, wasn't working. There stood an Indian man, a motorcyclist, in his raincoat, taking control of the congested traffic. Despite the danger and heavy downpour, he helped eases the traffic for other road users sake. I was touched by what this man can do. It was amazing how an ordinary man can make a difference in other people's life that evening. I've got a surprise award from FL Sam recently and haven't got a chance to thank him until today. 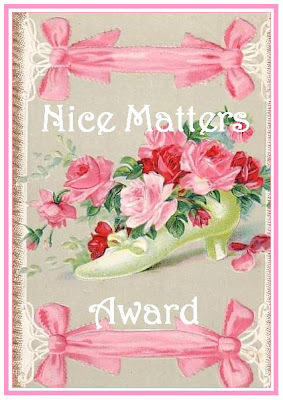 In Sam's blog, the originator of the Nice Matters Award is intended for "those that are just nice people, good blog friends, and those that inspire good feelings and inspiration!. Those that care about others, that are there to lend support, or those that are just a positive influence in our blogging world. Well, Sam, really thank you for the award. I really appreciate it and it's my honour to have a great blogging friend like you. I would like to present this friendship award to the following bloggers (in alphabetical order) who have helped me in one way or another. And some of them were so nice for dropping by even while I was away for long. Thank you guys and girls for being so nice to me! 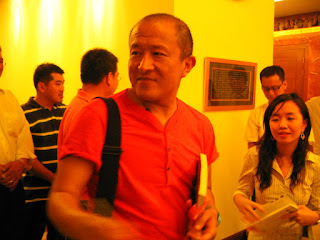 Recently I had a chance to attend a dharma talk by Dzongsar Jamyang Khyentse Rinpoche, who is better known as Khyentse Norbu in the film industry for his works like The Cup and Travellers and Magician. 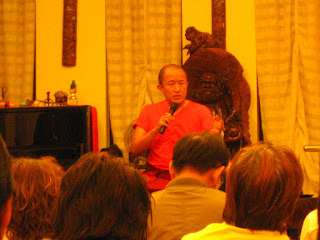 After a few days in Kuantan, he came to Petaling Jaya and gave a short talk that touches on the basic of meditation and the benefits of well wishes for the people around us. It was a rush evening but I was glad to finally meet up with Rinpoche after so many years. 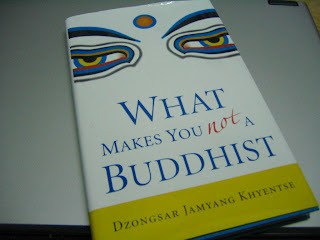 Rinpoche just published a book called, What Makes You Not A Buddhist, and we managed to get hold of the book and got his signature. I've only finished the first two chapters and hopefully I'll be able to read more today. Will share some of the content from the book once I've finished reading the book.